But, in all cases I've encountered, these reports neglect to mention that on average, civilian federal workers make 17 percent more than similar workers in the private sector, according to a 2017-2018 report by the Congressional Budget Office. That's total compensation, so we're including both wages and benefits. As of this writing, the current shutdown has only lasted three weeks, which means all those furloughed workers profiled in national news stories are likely still coming out ahead of their private-sector colleagues. Moreover, given that both Trump and Congress have committed to pay furloughed workers back pay, it's a safe bet that federal workers will continue to enjoy a healthy advantage over private-sector workers when it comes to compensation. 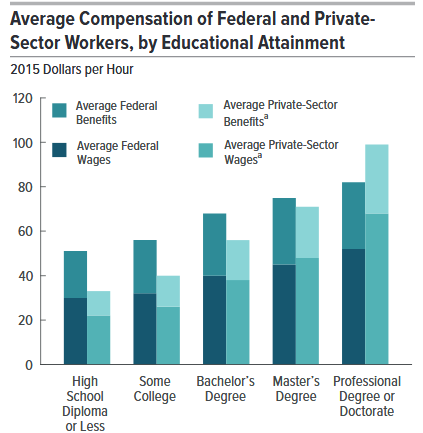 Only when we look at federal workers with PhDs and other advanced degrees, do we find some federal workers who actually make less than similar workers in the private sector. Wages among highly-educated federal employees were 24 percent less than in the private sector, according to the report. Benefits remained "about the same." That might sound like a big number (to some people unfamiliar with federal finances), but it's helpful to keep in mind that federal workers make up only 1.5 percent of the federal workforce. And not all of those are furloughed. The real cost to the private sector is in the form of industries that are paralyzed as a result of understaffed federal regulatory agencies. (As mentioned in this article about craft beer.) When the private sector isn't allowed to function without regular certification and inspection from federal agents, that means shutdowns prevent the private sector from functioning. This, of course, isn't an argument for more government spending. 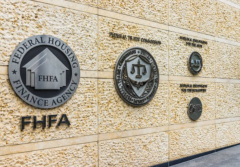 It's an argument against a vast federal regulatory apparatus that can't be counted on to perform the bare minimum of tasks it has promised to perform. All of this is just a good reminder that these jobs should never have been federal jobs in the first place. After all, many of these positions are already by definition "non-essential," and from the national parks to the airports to the FBI, the federal workers are doing jobs that could easily be taken over by state and local authorities, or by the private sector. Ultimately, all of the problems we're being told about as a result of the government shutdown are problems caused by a federal government itself, which has inserted itself into every nearly every corner of daily life nationwide.